“Artist for a Day (Ichijigahaku)” was founded in the wake of the Great East Japan (Tohoku) Earthquake, which occurred on March 11, 2011, bloomed from an idea of an artist. 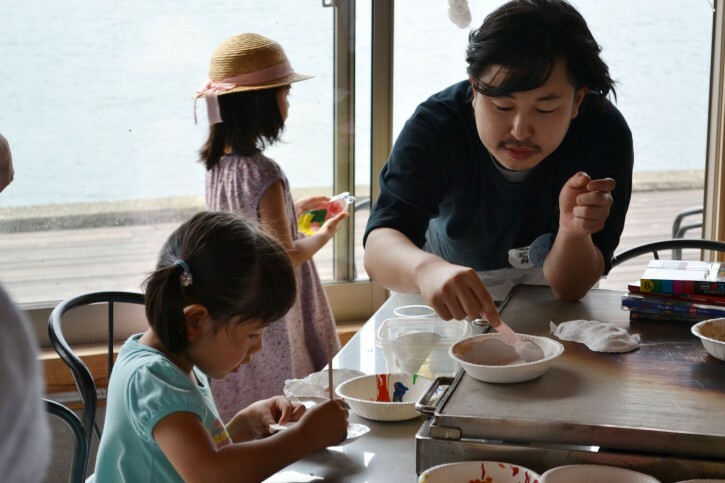 “Artist for a Day (Ichijigahaku)” is a non-profit organization dedicated to cultural and artistic enrichment of Japan by supporting today’s leading artists to bring and teach “Art” to the children and the communities that are rarely exposed to it. Following the Great East Japan Earthquake, “Artist for a Day(Ichijigahaku)” has been focusing on 4 main projects for the children in the 3 prefectures within the Tohoku region. A project designed to link the sponsors and the 3 prefectures in the shape of a “Gift” of art workshop. From a list that can be found on Ichijigahaku website (www.ichijigahaku.com), sponsors can choose which workshop to support and make a donation per program. We hold other art workshops in various occasions related to the rebuilding effort in the earthquake affected areas. To name a few, we have held a workshop at the Miyagi Prefecture PTA event, as well as making wall papers for the “Banya” (fisherman’s work station) of disaster affected Higashi Matsushima Bay at the Art Fair Tokyo. We have been involved in various community projects in Tohoku in collaboration with local people we met through our art workshop projects. We started from organizing a class for children, with the help of the local school teachers, university professors and local fishery organizations. We then produced a memorabilia for an elementary school, which is soon to be merged with a neighboring school and lose its name as a result of Tsunami damage. We donate art supplies to the children in the three prefectures of Tohoku that are affected by the earthquake. Support from individuals, groups and corporations are very precious to us! However small, the generosity of donors like you gives “Artist for a Day (Ichijigahaku)” a chance to reach out to more children and communities. If you have a workshop space or a workshop that you would kindly provide us, please do not hesitate to contact us. Together, let us create a chance for children to experience art and time to free their minds! “Gift of Art Workshop” gives you a chance to donate a workshop. You could sponsor a whole workshop or partially by increments of 50,000 yen. Please visit our website and see what types of workshops you can sponsor!